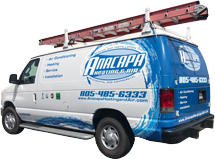 Anacapa Heating & Air is a local, family-owned HVAC contractor that provides affordable, expert heating and air conditioning services in Newbury Park and surrounding areas. With over two decades of experience, we've proudly served more than 20,000 residential and commercial clients throughout Ventura County. Our clients turn to us for our high-quality air conditioning and heating systems and expert furnace and air conditioner repair, installation, and maintenance services. We are dedicated to offering fair rates, unparalleled customer service, and personalized HVAC solutions. Call Anacapa Heating & Air today to schedule any of the heating and cooling services listed below. We hold a C-20 California license and are a member of IHACI, the Institute of Heating and AIr Conditioning Industries. We're available to visit your Newbury Park home or business Monday through Friday, 8:00 a.m. - 5:00 p.m. and provide on-call, emergency repair services seven days a week. Since 1998, we've worked hard to earn our reputation as one of the best Carrier Factory Authorized Dealers serving Newbury Park and surrounding cities throughout Ventura County. As a Carrier Factory Authorized Dealer, we are qualified to sell and install the complete line of high-performance, energy-efficient Carrier air conditioning systems. Our team of HVAC technicians participates in extensive factory training on A/C installation and will address your cooling needs to ensure optimal efficiency at budget-friendly rates. You can trust Anacapa will design and install your new air conditioning system according to the industry's leading standards and get the job done right the first time. Because of our exceptional workmanship and Carrier's impressive line of air conditioning systems, we are able to stand behind every AC installation with a 12-month, 100% customer satisfaction guarantee: If you are dissatisfied with your new Carrier air conditioner in any way, we will work to promptly correct the issue or remove the equipment and refund your purchase price. At Anacapa Heating & Air, we understand that purchasing a new cooling system is a big investment. Call us today to receive a free in-home consultation with an upfront quote and learn more about available rebates and financing options with approved credit through Wells Fargo Bank, N.A. If you are experiencing air conditioning issues, give Anacapa Heating & Air a call and we will come out to your location anywhere in or near Newbury Park. Our NATE-certified technicians are highly trained and well-qualified to accurately diagnose and repair nearly all major makes and models of air conditioning systems, including Trane, Lennox, Goodman, Carrier, Bryant, Day & Night, American Standard, and more. Whether you're experiencing refrigerant leaks, a decrease in air flow, or temperature control issues, you can trust that our team of HVAC experts will always apply the industry's best practices and provide honest advice and cost-effective solutions. We use flat-book pricing for all our A/C repair services, and our standard $69 service call and diagnostic fee can be applied to the overall cost of your cooling system repair. 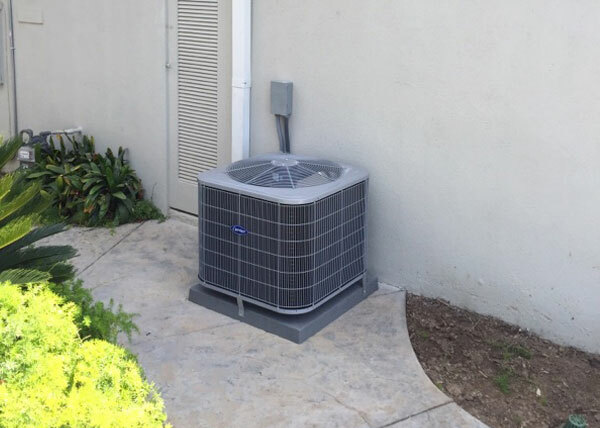 In addition to our A/C repair services, we also offer our Newbury Park clients thorough 20-point air conditioner inspections and tune-ups to maintain and extend the life of their cooling systems. Call (805) 485-6333 today to schedule your air conditioner tune-up. Our A/C maintenance visits are $79. For the best value, join our Preventative Maintenance Club, which includes two to four maintenance visits a year and gives you priority scheduling and special discounts. For professional heating system sales and installation in Newbury Park, call the experts at Anacapa Heating & Air. 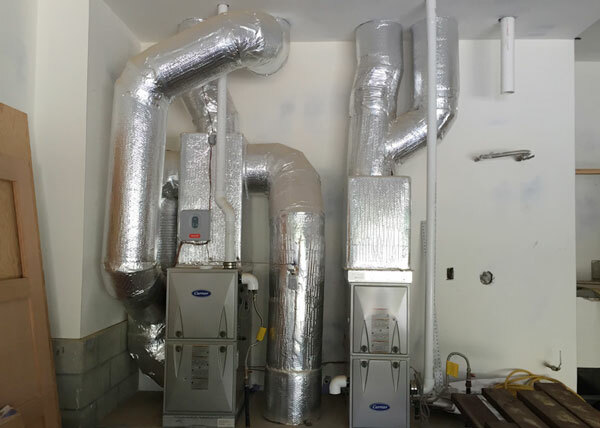 We have installed thousands of gas furnaces over the last 20 years for satisfied commercial and residential customers across Ventura County. We are committed to providing the best in HVAC equipment and understand that every heating system installation is unique to the needs of the individual customer and their home or business. Anacapa provides free in-home consultations for new furnace installations and replacements. During a consultation, one of our NATE-certified and Carrier-trained technicians will evaluate your existing heating system, including your heating equipment, ductwork, and registers. We perform a load calculation and take measurements to make sure your furnace is properly sized and that your ductwork is able to support it. With our expertly designed central HVAC system, you'll enjoy optimal indoor comfort and energy efficiency. Call us today to schedule a consultation for your furnace installation in Newbury Park. Our furnace installations are backed by a one-year, 100% satisfaction guarantee, and our Carrier furnaces include a 10-year limited parts warranty. Call on Anacapa Heating & Air when your furnace won't light or your heater blows cold air. We are your go-to HVAC contractor for all heating system repair services in or near Newbury Park. Our experienced technicians are certified by NATE (North American Trade Excellence) and undergo extensive training to accurately diagnose and repair heat pumps and furnaces from all major brands, including York, Carrier, Bryant, Lennox, Goodman, Amana, Maytag, Luxaire, American Standard, Trane, Coleman, Tempstar, Rheem, Ruud, and more. When you call us for a service visit, we will always take the time to perform a thorough inspection of the heating system and use state-of-the-art diagnostic equipment to determine what repairs are needed. We then recommend the best, most cost-effective solution for your specific heating needs. You can trust that we will do all we can to extend the life of your existing heating equipment unless we determine that replacement is absolutely necessary or much more cost-effective. To help prevent costly future repairs, Anacapa Heating & Air also offers furnace tune-up services in Newbury Park and surrounding areas for only $79. Keeping on top of your furnace's preventative maintenance needs can help to improve your indoor air quality, lower your energy bill, and keep your heating system running at optimal capacity. We recommend at least two visits from an HVAC professional per year for residential properties and two to four visits a year for commercial properties, depending upon your level of usage and the age and type of HVAC system you have. If you are interested in getting on a routine schedule for your HVAC maintenance, consider joining our Preventative Maintenance Club. Members of our Preventative Maintenance Club receive the best value for A/C and heating tune-ups with our personalized programs that include priority scheduling, 10% off all parts and materials needed for repairs, and two to four visits per year that are proactively scheduled by our office. Whether you are scheduling a first-time furnace tune-up or are a member of our Preventative Maintenance Club, we will always follow our 20-point checklist. At Anacapa Heating & Air, our goal is to provide the best value in high-quality heating and air conditioning services to our Newbury Park residents and businesses. As a local HVAC contractor, we are proud to receive most of our business from returning clients and customer referrals throughout Ventura and Santa Barbara County. Call us today! We're available to address your heating and cooling needs 8:00 a.m. - 5:00 p.m., Monday through Friday, and because we are on-call seven days a week, we can also accommodate HVAC emergency service requests in or near Newbury Park.